When arriving in Mumbai, part of me hoped that the Women's World Cup would be plastered across billboards, banners would drape from lamp-posts and newspapers would dedicate column inches to the largest cricketing event in the women's game. After all, India is a country where cricket is not just a way of life, it IS life, yet the cynic in me was not surprised when none of the aforementioned was visible. And here is the issue. How the women's game is seen must be changed and the host board the BCCI and the governing body the ICC must be held accountable for the severe lack of publicity. I am no businessman, but if you have a strong product and don't allow the market to know about it, then you won't reap the profits. The product on show (certainly in Mumbai) has exceeded expectations. The cricket has been not only exciting, but full of flair, extraordinary skill and technique, and has featured a passion and exuberance from the players that any international sports team would do well to match. Something lacking from the women's game has been power. The ability to hit bowlers over the infield and to clear the boundary, the strength to hurry batsmen onto the back foot or make them sway evasively from the short ball. But on the evidence of the group stages, that too is a thing of the past. We have seen in every game played, sixes being launched to all parts of the ground, boundaries being scored seemingly as soon as the ball has left the bat, and totals being achieved that are rewriting history books. 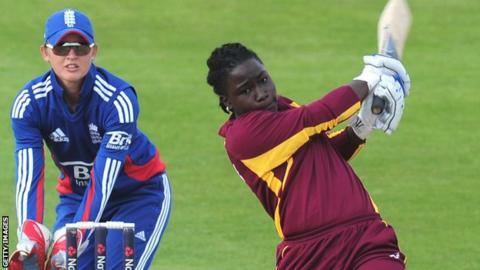 Take Deandra Dottin from the West Indies: a half-century off 20 balls versus Sri Lanka. Another batter Stafanie Taylor hit 171 in the same game. England captain Charlotte Edwards and India's Harmanpreet Kaur made centuries in the second group game when 512 runs were hit at an alarming rate. As an aside, England's 272-8 v India came after they were 29-1 after nine overs in that match, meaning, well, you do the maths. Sri Lanka are the surprise of the tournament. Having been heavily fancied to fall at the first hurdle, they shocked England in the first Group A fixture, and while many thought that was a one-off, they decimated hosts India in the final group game to reach the Super Six stage. This shows that there is significant improvement in the developing nations to challenge the big four of England, Australia, New Zealand and India. This competition can only be a good thing. The slightly disappointing aspect of Sri Lanka's success has been the failure of India to reach the next stage. The hosts attracted a healthy (if not outstanding) crowd, who, if you'd have closed your eyes, made enough noise to assume there was a stadium full of supporters. With their demise, I am afraid that so too will the attendances. In this next Super Six stage, the Test Match Special team will have an opportunity to see the Australian and New Zealand sides who have had to play in Cuttack over in eastern India, and who by all accounts have played wonderfully well. But with all the television and radio coverage coming out of Mumbai, Group B must have felt as though they were estranged from this tournament. The reasons behind the shift in venues have been well documented, but it has been another point which I feel has been detrimental to the WWC. There is much for the ICC and the respective international cricket boards to work with after this World Cup. Let us hope they see what entertainment has been on offer, so that 2017 is an even more popular event. One final note. Much as the batsmen have dominated, the bowler in me has loved every minute of watching England's Katherine Brunt or "Nunny" to her team-mates. Here is a woman who should be put into the same class as any male quick in world cricket. She is strong, athletic and muscular, has a touch of a crazy streak, and when the ball is in her hand, you can't keep your eyes off the match. Swinging the ball away at pace upfront, she also has the ability to "shove it up" the batsmen and not just take wickets herself, but get wickets for the team at the other end with players trying to score while she is taking a breather at fine leg. Look back in time... when Michael Vaughan needed a crucial wicket, he turned to Andrew Flintoff, Graeme Smith looks to Dale Steyn, as Cronje did to Allan Donald. Pick your captain and they'll have a bowling weapon that worries the opposition. Charlotte Edwards has just that in Katherine Brunt. I find it difficult not to say on commentary, "Go on.... bounce her again, Nunny....."
Charles, a former Leicestershire pace bowler, is commentating on the tournament for Test Match Special. TMS will bring you live coverage of all three England matches in the Super Six stage, plus the final.